The fall festival that takes place amidst natural nature...The healing tour where one enjoys the Creator's art pieces. 'The third Wolmyeongdong rock gemstone, life gemstone festival,' sponsored by Christian Gospel Mission, opened with an event on September 28th and it will run until the 27th of October. The rock festival is being held in the recreation center of Christian Gospel Mission, the Wolmyeongdong natural temple, located in the city of Keumsan in Chungnam province. The festival atmosphere has been been rising as thousands of people come each day to visit from every nation in the world and from every region of the nation. 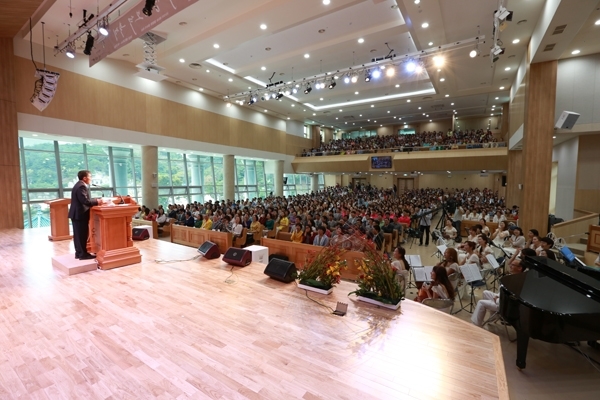 During the celebration message at the opening ceremony, which took place at the Holy Son’s House of Love, the president of Christian Gospel Mission, Pastor Jeong Myeong-seok, delivered proverbs, saying "It is movement, admiration, thanksgiving, love, shock and benefit when you see while knowing the stories and value"; and he said "There is no injustice like the injustice of a person living without knowing. Know and give glory to the Creator, who created the fall, and I bless that each of you will fulfill your dreams together with love, ideals and hope, as if finding many life gemstones, like rock gemstones, so that this 'rock gemstone, life gemstone festival’ will become a majestic, beautiful, mysterious festival." During the month of the Wolmyeongdong rock gemstone festival, there will be a music concert commemorating the Holy Son's House of Love, a dance contest and a soccer competition for the national club league, as well as various standing events [NP1] and a food marketplace. We also [NP2] placed Pastor Jeong Myeong-seok's 88 provebrs in various places between Heotgol to Nongol so that, through this, people could use their time not only to enjoy creations of God and the Wolmyeongdong rock gemstones, but also to remember the Creator and give Him glory. 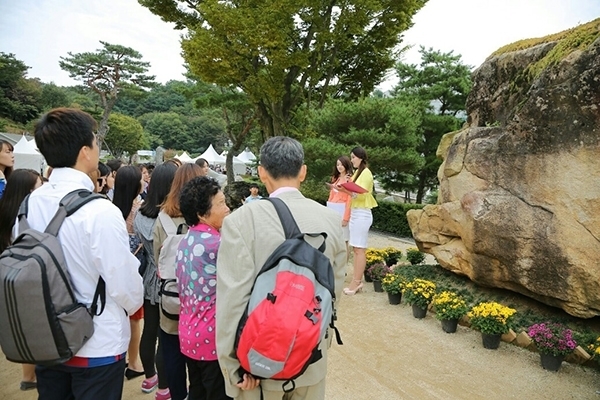 The rock festival is taking place in the Wolmyeondong natural temple, which has been built in clean, clear, natural nature. It offers emotional release to those who have become exhausted in the urban cities through the joy of the eyes and the mind as they enjoy creation and the rock gemstones, which are the art pieces of the creator, and, at the same time, nature also heals them. Consequently, the number of visitors is increasing. As Wolmyeongdong rock festival has been held several times, it is coming to be known as the fall festival to attend. [NP2]It’s more sophisticated English to not have ‘also’ at the start of a sentence.